Digital Multimeter Mastech MS8221 Auto/Manual Ranging DMM with backlight and battery tester. The newly introduced Mastech MS8221 digital multimeter is a fully featured DMM; which can be used to measure AC/DC current and voltage; resistance; frequency; capacitance and temperature up to 1800 farenheit; as well as diode and transistor check and continuity buzzer. Mastech SinoMeter MAS830L Digital Multimeter Pocket DMM with Data Hold. Transistor & diode test; overload protection. Single rotary switch operation. 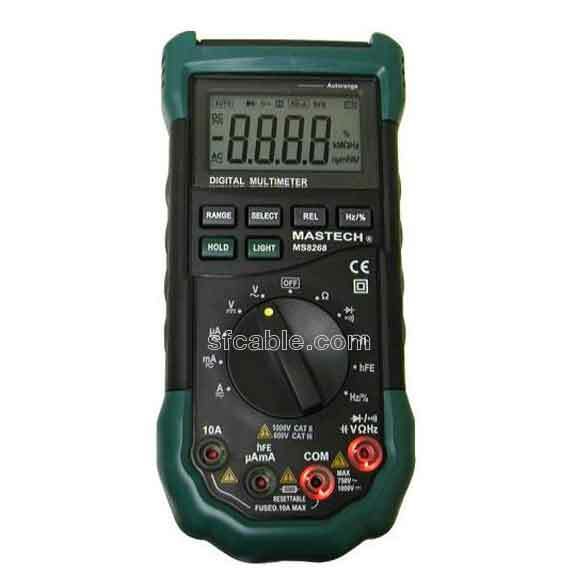 The newly released Mastech MS8268 is an auto/manual ranging digital multimeter. It is packed with many nice features such as sound and light warning for the jacks and back-lit LCD Screen. LCD Digital Multimeter Volt Ohm Amp Tester Mastech MS8264 Manual 30-Range :New design with strong and reliable case injected in a rubber holster protects the meter from damaging in harsh filed use. Backlight is good for dark reading. Large LCD display and hard-to-break building with a back stand. It comes with test leads and battery (For Test). A digital multimeter is used to measure two or more electrical values. This is largely used by technicians as a standard diagnostic tool for making connections. Being digital, they are more accurate and reliable than the traditional needle based meters. Our range in this category include Digital Multimeter Mastech MS8221 Auto/Manual Ranging DMM with backlight and battery tester, Mastech SinoMeter MAS830L Digital Multimeter Pocket DMM with Data Hold, LCD Digital Multimeter Volt Ohm Amp Tester Mastech MS8264 Manual 30-Range , Sinometer MAS345 PC-interfaced digital multimeter with 3 3/4 digits LCD display, etc. All our products are manufactured by ISO 9001-2000 registered manufacturers and are available at very competitive prices. You also get good after sales service and lifetime technical support on all our products.